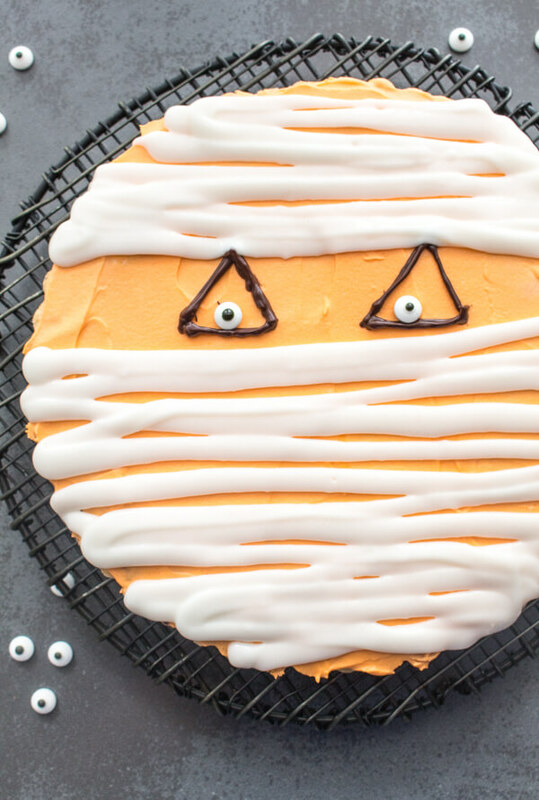 Halloween Mummy Giant Chocolate Chip Cookie, a delicious Big Cookie recipe, the perfect snack or dessert, soft on the inside and full of Chocolate Chips, with a creamy Cream Cheese frosting. A fast and easy way to make Halloween yummy and fun! 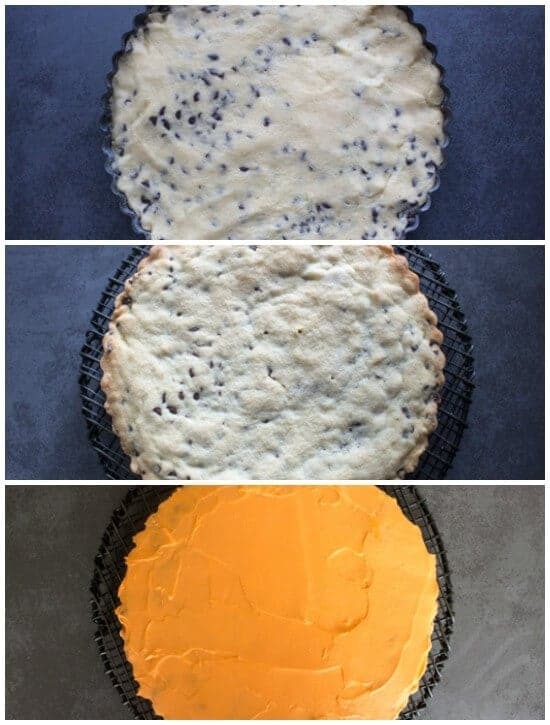 Ever since my kids were little and they would have a party at school, I would either make cookies or this Giant Chocolate Chip Cookie. Decorated with a little frosting to coincide with whatever holiday was being celebrated. Well my kids are now grown up and yes I am still making this Big Cookie but now mostly for friends and family. I must admit Halloween is one of my favourite holidays, next to Christmas of course. Lately I have seen a lot of Halloween baking on the internet. But the one that always stood out in my mind were Mummy Cookies, I thought they were the cutest things ever! I was having friends over for dinner so I thought why not make a giant cookie and decorate it for Halloween! I wanted to do something Mummyish. So that is how I came up with a Mummified Pumpkin! What a good laugh we had getting everyone to guess what it was. Halloween is very new to Italians, so after a couple of hints they did get it! This chocolate chip cookie is one of the best cookies I have ever made and that is why it never gets replaced. I topped it with a not too sweet Cream Cheese Frosting, which I coloured orange. Then I let it harden in fridge for about an hour. I purchased one of those icing pens from the store to make the triangle outline for the eyes. And yes thanks to my daughter for throwing in our cart at the grocery store when we were in Canada, those adorable candy eyes. Believe me she doesn’t let me forget that. Especially after I kept saying “Put them back, what do you need those for”? I filled my icing bag again with a very thick cream cheese frosting and using a thin straight icing tip I drew strips back and forth to form bandages on the pumpkin. 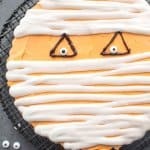 Simple, easy and not just cute, but this Halloween Mummy Giant Chocolate Chip Cookie is a very Yummy Mummy! Enjoy. 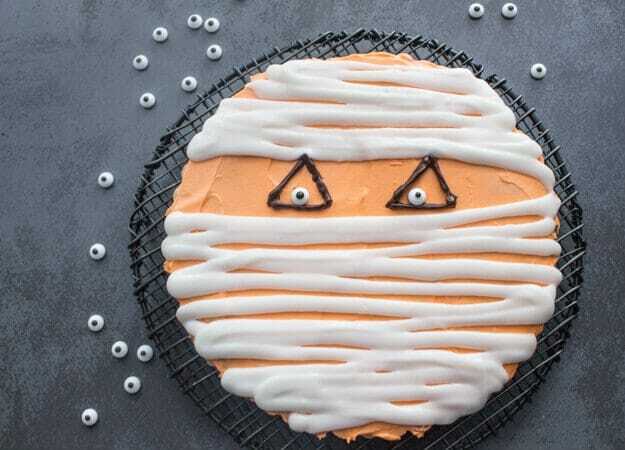 Halloween Mummy Giant Chocolate Chip Cookie, the best, fast and easy decorated cookie recipe. A delicious party treat,your kids will love it! 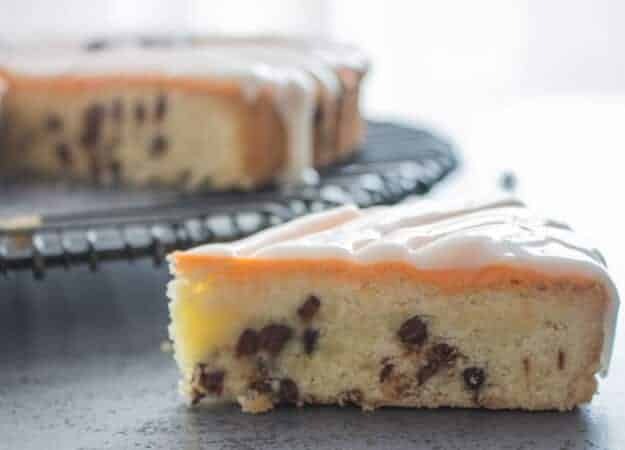 Using your hands or a spatula press onto a prepared 9,10 or 11 inch rimmed cake or pizza pan or baking sheet, press to cover the whole pan. Bake in a pre-heated oven for approximately 30-35 minutes or until golden and firm to the touch (test with a toothpick for doneness). Remove and let cool completely in pan , remove to plate to decorate. In a medium bowl beat together butter and cream cheese on medium-high speed until creamy approximately 1 minute. Lower speed to medium and add powdered sugar, beat well. Add salt, half and half and vanilla and beat until fluffy, about 3 minutes. Stir in food colouring. Frost cooled cookie and refrigerate for approximately one hour. In a small bowl mix together with a fork cream cheese, sugar, milk (one teaspoon at a timand vanilla, until smooth. Icing should be thick, refrigerate if necessary for approximately 30 minutes, stir to combine. Remove cookie from fridge and draw two black triangles for eyes, place a small dab of icing on the back of each eye and stick it in the triangle. 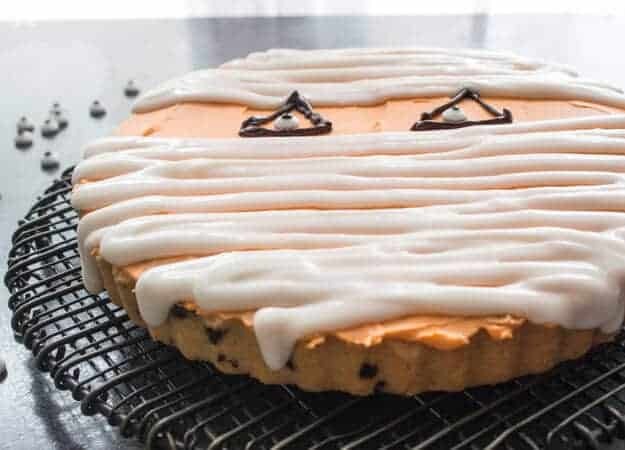 Place white cream cheese icing in decorating bag fitted with a flat basket weave and make criss cross strips back and forth over the frosted cookie to look like Mummy Bandages. Refrigerate to harden. Enjoy! Hi Heather, thanks so much. I’m loving this! My seven year old boy just told me yesterday he wants to be a Mummy for Halloween! I’m going to share this on my FB page later today! Thanks!